J.J. Faulk speaks with a staff member at JJ’s Place Greenhouse and Nursery, a business she owns and operates with husband Ryan in Lee County. JJ’s Place Greenhouse and Nursery opened for the day just a few minutes ago, but already customers are wandering through the grounds along U.S. 15-501, and group of landscape gardening students from nearby Sandhills Community College is gathering to hear what insights business owner J.J.Faulk has to share. As students meander from one long greenhouse to another, they pause for 15 minutes at a time to talk about, well, pretty much anything and everything agribusiness. How to manage growing cycles. What hurdles businesses need to overcome. Essentially, how to make a greenhouse and nursery work in the competitive market. Jessica J. Faulk — that’s J.J. — is a horticulture graduate of Sandhills Community College and an entrepreneur, reshaping the local agricultural landscape by helping others unleash their own innovative spirits. She owns and operates JJ’s Place in Tramway with her husband, Ryan, who contributes his own expertise as a crop scientist trained at North Carolina State University. And, last fall, they added a second location in Broadway, a garden center where they plan to focus on home decor and growing supplies. 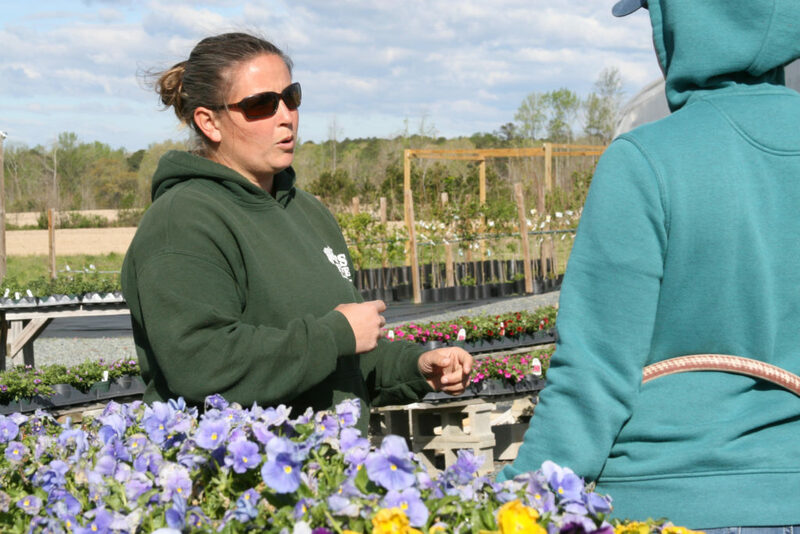 Minda Daughtry works with JJ’s Place as a horticulture agent for N.C. Cooperative Extension. She describes J.J.’s distinctive business approach as “Particularly J.J.” Fresh. Contemporary. Even imaginative. J.J. sees it as a “go-for-it style” — knowing what her customers want, understanding how the market is changing and seizing opportunities whenever they arise. If you told J.J. years ago that she’d be running such a successful enterprise, she might not have believed it. She’s known for the longest time that she didn’t want to work in an office — J.J. describes herself as a “hands-on, outside person.” But it was an eight-year stint working at Dale’s Greenhouse in Sanford that got her thinking about the future. After inheriting some land from her grandfather, she got started. The horticulture part was easy. Establishing a brand new business, though, not so much. In fact, it didn’t go very well at first. Navigating the complex web of rules and regulations just to get open was one hurdle. Being a woman in the male-dominated agricultural industry was another. The biggest challenge for women, J.J. says, is being underestimated. She recalls going into plumbing stores or lumber departments where she wasn’t taken as seriously as her background and expertise deserved. It’s not that sales people were rude, she says, but many treated her differently than male customers. J.J. and Ryan cleared all of those hurdles with style and have made JJ’s Place a success. Now, she enjoys sharing lessons learned with others, as she’s doing this morning with the landscape gardening students. Despite J.J.’s entrepreneurial spirit, it’s not numbers and strategy that fuel her passion. When Daughtry asks what’s so satisfying about the work, J.J. responds as if that were a no-brainer — the easiest question she’s had all day. Be sure to check out JJ’s place online at http://jjsplace.biz/ and on Facebook at https://www.facebook.com/jjsplace.biz/. Editors Note: This article is the second in a monthly series highlighting the impact local women are making on Lee County agriculture. The series, which is expected to run through November, has been developed through N.C. Cooperative Extension in Lee County. Articles can be found on the left side of this page or at the links below as they are released.